Welcome to Grind It Expresso Cafe!! 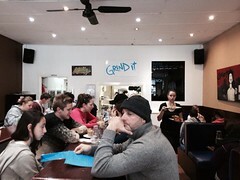 Situated near the Glenelg beach, this is a fabulous cafe for all you coffee lovers. Not a coffee lover? Not a problem! They have a good breakfast menu here, in which I (a non coffee drink) tried! This is a unique place in that when you sit down, you don’t get your orders placed right away. Because it’s such a small cafe, they need to take the orders one customer at a time. And because the kitchen is small, they won’t take another order until the previous dishes have been completed. As such, I waited about 30 minutes before I could order. I think this is the only thing I was not happy about, because I was sooo hungry. 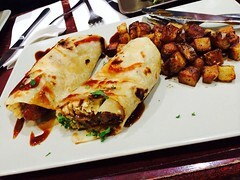 When I finally got to order, I decided to have a wrap…for champions! Mushroom, cheese, chicken all in one delicious wrap. I also added a side of potatoes just for the hell of it. I should also comment on my drink, I ordered an orange juice, and it is by far one of the freshest juice I’ve ever had in my life. What a nice, little cafe! If you don’t mind the wait, then you should come pay a visit!